William Charles Campbell Bignall Robinson was born in Hertford, England, on 4 October 1907, the son of William Robinson, publican, and Alice, née Bolton. Around 1911, the family arrived in Western Australia, and settled as farmers in the Williams district. Bill, as young Robinson was known, was educated at Tarwonga State School and Northam Senior High School before following his father onto the land. In 1937, after being employed by the Postmaster-General’s Department on the Albany line, he became secretary of the Wandering Road Board. On 11 May 1938, at the Holy Trinity Church, Williams, Bill Robinson married Gweneth (Gwen) Ellard Fleay, according to the rites of the Church of England. (By this time Bill had dropped the names, Campbell Bignall.) They had one son, William Raymond (Ray), born on 4 July 1939. On 1 September 1942, Robinson enlisted in the Royal Australian Air Force, having been released by the Wandering Road Board (Gwen did his work while he was away). He trained as a wireless maintenance mechanic and served on bases in Victoria and Western Australia, attaining the rank of corporal. He was discharged on 6 September 1945, returning to his former position. The following year he was engaged as secretary of the Pingelly Road Board (later Pingelly Shire Council), a position he held until retirement in 1974. He was also a delegate to the Central South Regional Council. Robinson was an active member of the Country Party in Western Australia. He was a member of the wool committee and the political executive of the Primary Producers’ Association of Western Australia, and, following the formation of the Country and Democratic League in 1944, secretary of the Wandering and Pingelly branches and secretary-treasurer of the league’s Narrogin District Council. 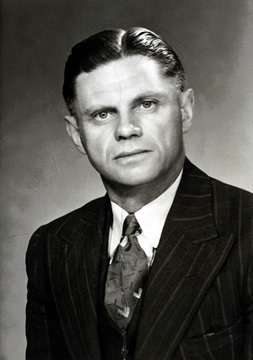 In September 1952, he was endorsed by the league to fill the Senate vacancy brought about by the death of Senator Piesse. At a joint sitting of both houses of the Western Australian Parliament in September 1952, Arthur Watts, Deputy Premier and Leader of the Country Party, nominated Robinson, who was elected unopposed. Robinson was sworn in the Senate on 7 October 1952. In his first speech, on 29 October 1952, he gave his ‘whole-hearted approval’ to the Oil Agreement Bill, which authorised the Government to dispose of its shares in the Commonwealth Oil Refineries. Robinson was emphatic in his belief that ‘governments should refrain from engaging in commercial or industrial enterprises’, arguing that, as a general rule, ‘when the cold, clammy hand of government control touches private industry there is a lack of the vigour and drive that is associated with private enterprise’. He believed that if governments needed to exercise control this was best achieved through legislation rather than direct government ownership. True to his Country Party ideals, Robinson showed a keen interest in rural progress, particularly in Western Australia. He supported the measures set out in the Wool Use Promotion Bill. ‘The wool industry’, he argued, ‘has a vast impact on all members of the community, and by and large its success or failure has a very serious effect on the economy of Australia generally’. He questioned the impact of Loan Council decisions on local government authorities, and the level of Commonwealth commitment to the Great Southern Water Scheme, which had received federal support in 1948. In what was to be his final speech in the Senate, Robinson highlighted the lamentable progress of this scheme to supply water to the agricultural areas and Great Southern towns of Western Australia. Citing Pingelly, he stated: ‘Since 1911, the residents of Pingelly have been paying water rates to the Government, and all that they get from the scheme is a filthy effluent reticulated through the town’. He believed the Western Australian scheme was what the Snowy Mountains hydro-electric scheme was ‘to the eastern States’, observing that the Snowy Mountains scheme was financed entirely by the Commonwealth. He requested that ‘at least half the cost of this comprehensive water supply scheme’ be met by federal funding. When Robinson stood for re-election to the Senate in May 1953, the Narrogin Observer noted that he had, in a brief period (nine months), shown ‘considerable aptitude and a sense of responsibility which would do credit to politicians of far greater experience’. Despite this assurance, Robinson was given fourth position on the combined Liberal-Country Party ticket and was defeated. He was again unsuccessful for the Senate in 1958. He also stood as a Country and Democratic League candidate for the Legislative Assembly seat of Narrogin in 1956 and for the Legislative Council in 1960, but without success. After retiring as shire clerk of Pingelly, Robinson moved to Perth, where he died on 21 January 1981. He was cremated, with Anglican rites, at Karrakatta. His wife and son survived him. Robinson was a small man, 5 feet 6 inches tall, with grey eyes and brown hair. On his enlistment application for the RAAF he was described as a ‘neatly dressed average type’ and ‘courteous’. People who knew him and worked with him thought him a person of ‘fine character, undoubted ability and sound commonsense’, with ‘a pleasant and tactful manner . . . gentlemanly, clean living and of sober habits’. A Freemason, he was held in high esteem in the local district, as were his parents before him. West Australian (Perth), 17 Sept. 1952, p. 3; Information provided by Mick Oliver, Shire of Wandering; Robinson, W. C.—War Service Record, B2455, NAA; Narrogin Observer, 3 Aug. 1951, p. 1, 29 Feb. 1952, pp. 11-12. West Australian (Perth), 17 Sept. 1952, p. 3; Louise Overacker, Australian Parties in a Changing Society 1945–67, F. W. Cheshire, Melbourne, 1968, p. 244; Narrogin Observer, 6 June 1952, p. 1, 19 Sept. 1952, p. 6; West Australian (Perth), 18 Sept. 1952, p. 6, 1 Oct. 1952, p. 2; WAPD, 30 Sept. 1952, p. 1151. West Australian (Perth), 8 Oct. 1952, p. 2; CPD, 7 Oct. 1952, pp. 2498-9, 29 Oct. 1952, pp. 3778-80. CPD, 26 Mar. 1953, pp. 1520-1, 15 Oct. 1952, p. 3071, 29 Oct. 1952, p. 3765, 11 Mar. 1953, p. 763, 26 Mar. 1953, pp. 1568-9; West Australian (Perth), 28 Mar. 1953, p. 2, 28 Apr. 1953, p. 4; Narrogin Observer, 2 May 1952, p. 3. Narrogin Observer, 10 Apr. 1953, p. 19; West Australian (Perth), 11 May 1953, p. 3, 14 May 1953, p. 6, 1 Nov. 1958, p. 9; Narrogin Observer, 1 Mar. 1956, p. 1; West Australian (Perth), 28 Apr. 1960, p. 1, 23 Jan. 1981, p. 47. Robinson, W.C.—War Service Record, B2455, NAA; Information, Shire of Wandering. This biography was first published in The Biographical Dictionary of the Australian Senate, vol. 2, 1929-1962, Melbourne University Press, Carlton, Vic., 2004, pp. 85-87.